The market for centrifugal compressors is projected to post substantial growth over the coming years primarily due to rise in number of industries such as oil & gas, steel, and cement as well as increasing government initiatives on providing energy efficient solutions. Additionally, Centrifugal compressors market is expected to witness highest India centrifugal compressor market forecast period revenues over the coming years owing to certain key features such as energy efficiency and noiseless operation. According to 6Wresearch, India centrifugal compressor market size is projected to grow at a CAGR of 4.7% during 2017-23. Rising environmental & safety regulations, efficient use of energy along with robust industrial growth is expected to propel the market of centrifugal compressors in the country. India centrifugal compressors market is also registering potential demand for high-capacity compressors, providing ample opportunities for global companies to penetrate the market. Oil & gas industry recorded highest India centrifugal compressor market share in 2016 and is further likely to enhance the demand for centrifugal compressors during the forecast period on the back of rising adoption of several practices primarily from injection of high pressure gas for oil recovery. India's overall industrial sector grew at over 7% during FY 2015-17; wherein, the manufacturing and electricity, gas, water supply and other utility services sub-sectors collectively enjoyed 10% growth. The growth registered in these areas would spur the market demand for centrifugal compressors. The India centrifugal compressor market report thoroughly covers centrifugal compressors market by compressor technology, compressor type, and end user. 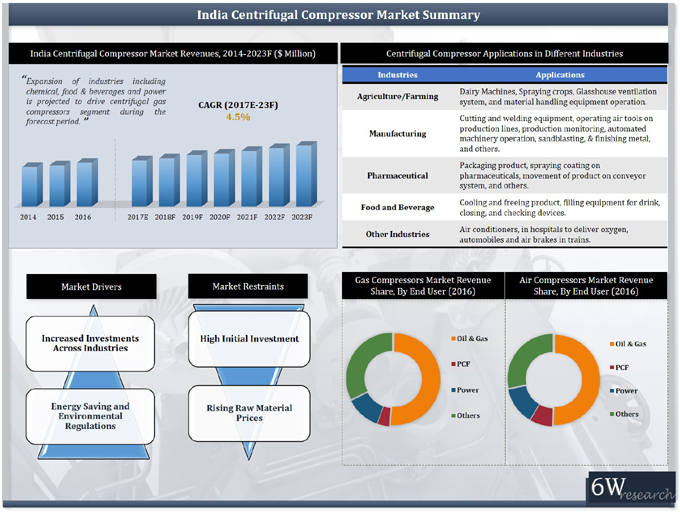 The India centrifugal compressor market outlook report provides an unbiased and detailed analysis of the India Centrifugal Compressor Market trends, opportunities/ high growth areas, market drivers, which would help stakeholders to decide and align their market strategies according to the current and future market dynamics.